The Lord will teach His way to those who fear Him. I like that! The secret of the Lord is with those who fear Him. He will show them His covenant. Do these words warm your soul like they do mine? Our God is so generous and good. He has longed for relationship with His children since creation. He came down in the cool of the day to talk with Adam and Eve. He opened the Holy of Holies for us when Jesus Christ died on the cross so that we can speak directly with Him. He pours out His Holy Spirit on His children and speaks to us through Him. He wants to share with us. Not only that, but He offers protection, inheritance, and prosperity to us, as well. What a good and amazing God we have! We have done nothing to deserve His generosity. We have not earned His respect or His esteem. He has simply chosen us. He wants us. He loves us. Do you want to know His ways? Do you want to see His covenant or hold His secret? It starts with a relationship. When we fear Him: respect, worship, submit to, and be in awe of Him, then these things are available to us. His word tells us so. I don’t know about you, but I want to tap into that so deeply! I want to know as much as I can. I want to be as close to Him as I can get. I want more and more and more. Let’s dig in and draw closer. Let’s let Him teach us even more. One of my favorite types of prayer journals is one where I write down scriptures that speak to me as I’m reading. Then I often write out a prayer after the ones I feel led to pray about. This type of journal has some good benefits. It can help you focus on what the scriptures are really saying, instead of just skimming over them. 3-12-14: “My grace is sufficient for you, for My strength is made perfect in weakness.” 2 Cor. 12:9 Lord, perfect Your strength in my weakness which I give to You to use for Your glory, and as Paul said, “that the power of Christ may rest upon me. In 2014, I also chose John 15:4 to be my verse for the year: “Abide in Me, and I in you. As the branch cannot bear fruit of itself unless it abides in the vine, neither can you, unless you abide in Me.” I began to pray that God would show me how to abide in Him. Then I began to research vines, and the pruning and training of vines. I began to look up every verse I could find that talked about God being the vine, about us bearing fruit, or about abiding in Him. I wrote all of it in my journal. 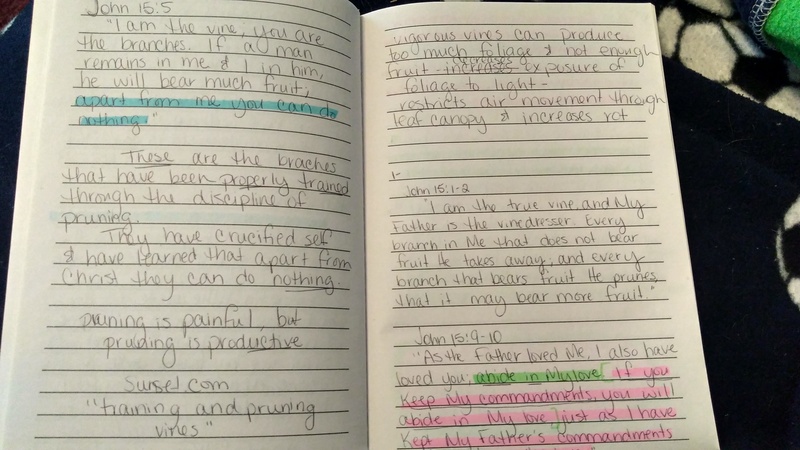 It was a journey that I desperately needed and my journal was my lifeline to the Lord. I can now go back and see the progress I made and the ways that God met my needs during that time and brought me ever-closer to Him. I encourage you to keep your journal open beside you as your read your Bible. If a scripture speaks to you, simply write it down. Give the Lord a chance to draw you closer to Him through this practice. I think it will surprise you. His Word is powerful enough to speak something new to us on a daily basis. It’s even better when we can record those new discoveries! Have you found great treasure? I just caught a few minutes of a movie where a girl finds a piece of some long-lost treasure. It ended with her walking away with that one piece and going on with her life. Not hardly. I only saw the first 15 minutes of the 108 minute movie, but I think it’s safe to assume that the remaining 93 minutes will be about her going back to try to find the rest of the treasure. Watching the girl’s intrigue and excitement about the treasure she discovered reminded me of the treasure we find in Christ. We all love treasure. We all love finding something of worth. We all like the excitement of things that are out of the ordinary. What was the piece treasure you found that pointed to Christ? Was it a scripture that spoke directly to your situation? Perhaps God answered a prayed even when you weren’t serving Him? Did you witness a miracle or a transformation in someone’s life? Was your piece of treasure the Holy Spirit comforting you when nothing else could? Whatever the exact piece of treasure you found, it’s hard to simply walk away with that 1 piece and go on with life. It’s almost impossible not to be intrigued by the prospect that there is more where that came from. What’s the best part? There truly is more waiting for us. Much more. All we have to do is go back and search for another piece. James 4:8 tells us that when we draw near to God He will draw near to us. That means that when we search for more of Him, we will find it. He is ready to reveal more when we continue to dig. If you have found a piece of the great treasure that is in Jesus Christ, don’t walk away with just that 1 piece. Go back and dig for another. It’s there just waiting for your discovery.